St David's is a large medieval church, founded in 1187 by the Bishop of St David's, on the site of the Synod of Brefi in 550 AD. Inside the church is a collection of 6th-9th century Celtic stones. Around 550 AD a synod of the Welsh church was held near the site of the Roman fort of Bremia. The synod was called to discuss the Pelagian heresy, a theory that believers could find salvation by living a good life. It is probably no coincidence that the Pelagian beliefs may have originated with a Welshman named Morgan, whose name was translated into Latin as Pelagius. The synod debate was so raucous that David could not make himself heard above the din. He placed a cloth on the ground, and the the earth rose to form a mound, so that his voice could be heard by all the assembled churchmen. The mound raised by St David is said to be the one on which the church was later built. Or, if you ascribe to less miraculous history, the church may stand on the site of a Bronze Age barrow. Whether or not the miraculous mound-raising took place, we do know that there has been a site of worship at Llanddewi Brefi since the 7th century, if not earlier and that early church was associated with St David, or perhaps founded by him directly. In 1187 Bishop Thomas Beck of St David's founded a college of secular canons here, and built the large stone church we see today. 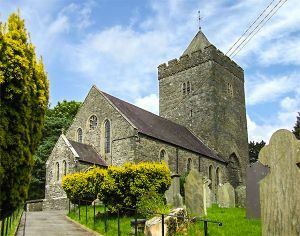 During the medieval period Llanddewi Brefi was a centre of learning; the manuscript known as the Book of the Anchorite of Llanddewi Brefi was produced here in 1346, and included the earliest known translation into Welsh of Rhygyfarch’s Life of David. Though the current building dates to the 12th century, fragments of much older carved stones are embedded in the walls. Much of the church was heavily restored in the Victorian period. The link with the past is emphasised by a collection of Celtic crosses, some dating as far back as the 6th century. There are 6 stones, ranging from the 6th to the 9th century, and together they make up the largest collection of Celtic stones in Ceredigion. There is also 14th-century font bowl in the chancel.